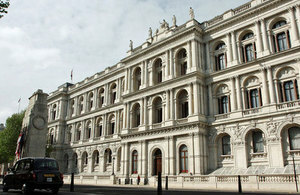 Foreign Secretary William Hague met Ukrainian Foreign Minister Kostyantyn Gryshchenko today. Today the Ukrainian Foreign Minister Kostyantyn Gryshchenko visited the Foreign Office to meet the Foreign Secretary. During their meeting, they discussed the development of democracy in Ukraine, Ukraine’s ambitious political and economic reform agenda and opportunities for increased trade and investment, in particular through early completion of negotiations on a deep and comprehensive Free Trade Agreement with the European Union. The Foreign Secretary welcomed the Ukrainian Government’s aspirations for membership of the European Union and assured the Ukrainian Foreign Minister of the UK’s support for the reforms that will be necessary to achieve this.